This method is an easy and almost all android phone and android tablet can use this method, Internet sharing from android to PC or laptop could do with some very simple steps using only the applications contained in the google play store for free. There is little difference from the android phone used as a modem with Internet sharing from android to PC, the difference is if the android phone used as a modem and then the phone cannot be use to open other applications, but by using this application i.e the EasyTether app android phone just simply sharing Internet via usb cable so android phone can still be used to open another application. Internet speed depends on the speed of Internet access or provider use and 3g phone. 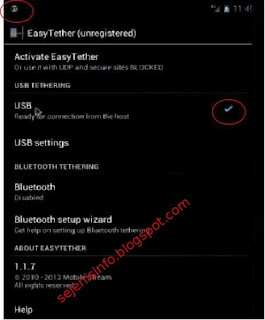 As I mentioned earlier this app called EasyTether an apk or android application that serves to synchronize or share Internet from android phone to PC or laptop via USB cable, and if for the opposite of sharing Internet or internet connection from PC or laptop to android this application can not do it, there is a reverse tethering applications, these applications can now connect to the internet or internet sharing of computer, pc or laptop to android. EasyTether can be used in windws xp, windows 7, windows 8, vista, Linux, Mac OS X, etc., and can be used with bluetooth for android tablet. 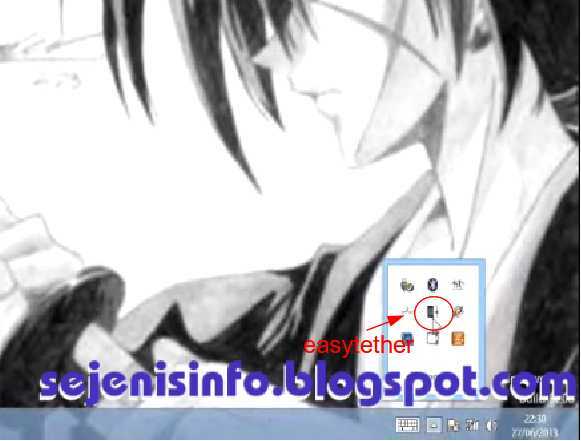 There are two choice of EasyTether like the paid and the free for the free EasyTether the called is EasyTether lite. Note : sometimes when open google sites and sites related to the google site is not connect, try using alternate search engines like yahoo and bing. 2. Download EasyTether along with drivers for windows or Linux and mac here. 4. 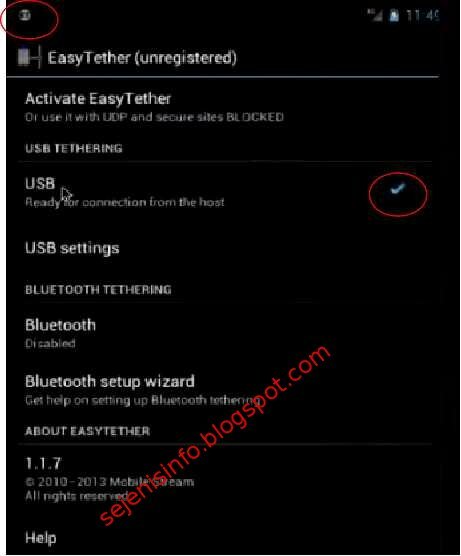 EasyTether installed on each device and activate EasyTether on android, but before activated your usb debugger must be switched on android go to Settings -> Developer options -> USB debugging. Activate Internet on hp or tablet android and activate EasyTether. Enable EasyTether on your PC or laptop. 5. Once both are installed and running next steps connect the usb cable to your computer or PC or laptop and and if it has been read by android in windows then connect EasyTether in its windows by clicking the button on the task bar EasyTether windows like in the picture below. The steps above are a way to share the Internet from android to a laptop using a USB cable, so not share Internet from laptop to android. This is the way to use the computer / PC and also if the laptop there is no wireless wifi device, but if there is Wi-Fi on a laptop or PC i suggest to use Wi-Fi connection, because it will be easier and the Internet may run very well. 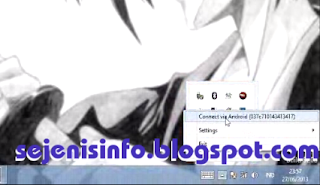 Can see here on how to share internet from android to PC/laptop via Wi-Fi. Connect your pc or laptop with bluetooth and connect bluetooth pan via android but you can download anything only browser and chat. why no device to connect?? have you installed your device driver in windows ? Cool! I want to try it too. I only tried to connect internet from computer to android, but not android to computer. Thanks for sharing. is it possible to tether WITHOUT installing any driver in windows ? I tried it but it's not working! In order to connect an Android phone to a standard USB device, you need to use a micro USB to USB Type A Female convertor, but this should also be an OTG Cable . A mini OTG Cable is available in the market for affordable price. It is connecting but only shopping app is opening Google is not opening... Plz help.. This blog is really helpful & contains more drivers. Thanks for sharing the useful article which is helpful for many people. Most USB cables have two types of connectors, one on each end. A type A connector is on the end that plugs into your computer. These are wide and flat, with a plastic piece inside that prevents the user from plugging them in upside down. Most users are familiar with the type A USB ports on their computers, as virtually every peripheral device on the market these days uses them. For instance, printers, scanners, and digital cameras all connect to computers via a USB cable. USB drives, which are small, mobile data storage devices, usually have type A connectors on one end, which plug directly into the USB ports on a computer. I’m pretty tough on my cables and I would bet that these cables would take a beating and keep on working. This is only a really light look at all the great USB products at CES 2017. I was personally amazed with the scale of USB product promotion but it makes sense, USB products are multi-billions of dollar business and everyone wants a slice of the pie. Thank you for sharing excellent information’s. Really your content is so informative. So please share some more content ..